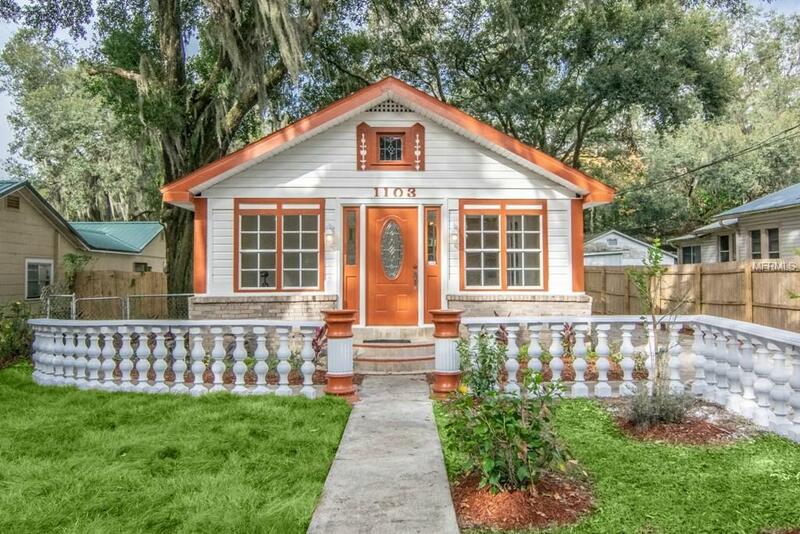 Own a little of Plant City History! Built in 1930 this spacious home has 6 bedrooms with 2.5 baths. Home has been updated with modern conveniences while keeping a little of the past with its original hardwood flooring. Step into the large windowed foyer/sunroom and follow the French doors into the living room with chandeliers and fireplace. The formal dining room is adjacent to the kitchen with beautiful original wood flooring, Kitchen features marble tile flooring with beautiful refinished cabinets featuring corner Lazy Susans for convenient storage. Great Laundry room located across from kitchen with a full size washer/dryer and half bath. Master bedroom suite with its original wood flooring and huge closet space opens to the wooden rear deck. Updated master bath comes with glass shower doors, new vanity and light fixture. Additional 3 bedrooms with great window views are located just up the stairs. Concrete pillared columns has been added to give an elegant feel to the front exterior. Long concrete driveway leads to the attached one car. Shaded rear yard is fenced and comes with outside storage. Seller is an investor and has never occupied the property. All room sizes are approximate. Convenient to Alexander St and I -4 East and West. Listing provided courtesy of Demeter Properties Inc.